The Cisco Unified Computing System™ (Cisco UCS®) is a next-generation data center platform that unites computing, networking, storage access, and virtualization resources into a cohesive system designed to reduce total cost of ownership (TCO) and increase business agility. The system integrates a low-latency, lossless 10 Gigabit Ethernet unified network fabric with enterprise-class, x86-architecture servers. The system is an integrated, scalable, multichassis platform in which all resources participate in a unified management domain (Figure 1). The Cisco UCS 6324 Fabric Interconnect extends the Cisco UCS architecture into environments with requirements for smaller domains. 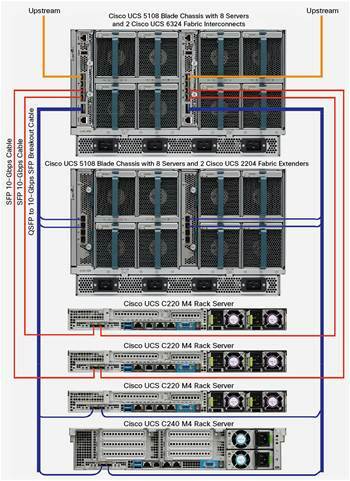 Providing the same unified server and networking capabilities as in the full-scale Cisco UCS solution, the Cisco UCS 6324 Fabric Interconnect embeds the connectivity within the Cisco UCS 5108 Blade Server Chassis to provide a smaller domain of up to 20 servers. The Cisco UCS 6324 Fabric Interconnect Fabric Interconnect provides the management, LAN, and storage connectivity for the Cisco UCS 5108 Blade Server Chassis and direct-connect rack-mount servers. It provides the same full-featured Cisco UCS management capabilities and XML API as the full-scale Cisco UCS solution in addition to integrating with Cisco UCS Central Software and Cisco UCS Director (Figure 2). From a networking perspective, the Cisco UCS 6324 Fabric Interconnect uses a cut-through architecture, supporting deterministic, low-latency, line-rate 10 Gigabit Ethernet on all ports, switching capacity of up to 500 Gbps, and 80-Gbps uplink bandwidth for each chassis, independent of packet size and enabled services. Sixteen 10-Gbps links connect to the servers, providing a 20-Gbps link from each Cisco UCS 6324 Fabric Interconnect to each server. The product family supports Cisco® low-latency, lossless 10 Gigabit Ethernet unified network fabric capabilities, which increase the reliability, efficiency, and scalability of Ethernet networks. The fabric interconnect supports multiple traffic classes over a lossless Ethernet fabric from the blade through the fabric interconnect. Significant TCO savings come from a Fibre Channel over Ethernet (FCoE)-optimized server design in which network interface cards (NICs), host bus adapters (HBAs), cables, and switches can be consolidated. The Cisco UCS 6324 Fabric Interconnect is built to consolidate LAN and storage traffic onto a single unified fabric, eliminating the capital expenditures (CapEx) and operating expenses (OpEx) associated with multiple parallel networks, different types of adapter cards, switching infrastructure, and cabling within racks. The unified ports allow the fabric interconnect to support direct connections from Cisco UCS to Fibre Channel, FCoE, and Small Computer System Interface over IP (iSCSI) storage devices. The Cisco UCS 6324 Fabric Interconnect hosts and runs Cisco UCS Manager in a highly available configuration, enabling the fabric interconnects to fully manage all Cisco UCS elements. The Cisco UCS 6324 Fabric Interconnect Fabric Interconnects support out-of-band management through a dedicated 10/100/1000-Mbps Ethernet management port. Cisco UCS Manager typically is deployed in a clustered active-passive configuration on with two UCS 6324 Fabric Interconnects connected through the cluster interconnect built into the chassis. For virtualized environments, the Cisco UCS 6324 Fabric Interconnect supports Cisco virtualization-aware networking and Cisco Data Center Virtual Machine Fabric Extender (VM-FEX) architecture. Cisco Data Center VM-FEX allows the fabric interconnects to provide policy-based virtual machine connectivity, with network properties moving with the virtual machine and a consistent operational model for both physical and virtual environments. 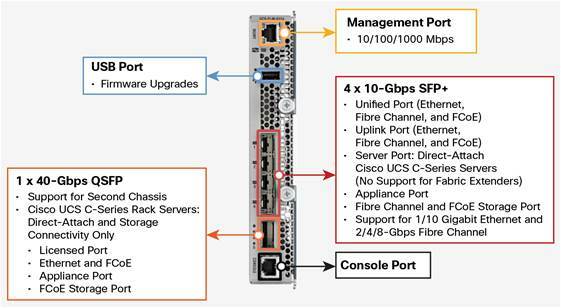 The Cisco UCS 6324 Fabric Interconnect Fabric Interconnect (Figure 3) is a 10 Gigabit Ethernet, FCoE, and Fibre Channel switch offering up to 500-Gbps throughput and up to four unified ports and one scalability port. Table 1 summarizes the characteristics of the Cisco UCS 6324 Fabric Interconnect. Table 2 summarizes the features and benefits of the Cisco UCS 6324 Fabric Interconnect. The Cisco UCS 6324 Fabric Interconnect supports a wide variety of 10 Gigabit Ethernet connectivity options using Cisco 10GBASE SFP+ modules. In addition, the four SFP+ uplink ports support 1 Gigabit Ethernet connectivity options using 1GBASE SFP modules. Alternatively, 2/4/8-Gbps Fibre Channel SFP+ interfaces are supported. Table 3 lists the supported transceiver options. The Cisco UCS 6324 Fabric Interconnect supports a QSFP+ port that provides connectivity for up to 4 Cisco UCS rack servers. Table 4 lists the transceiver options support by the scalability port. Table 5 provides cabling specifications for the Cisco UCS 6324 Fabric Interconnect. Table 6 summarizes the physical and environmental specifications for the Cisco UCS 6324 Fabric Interconnect. Table 7 summarizes Cisco UCS 6324 Fabric Interconnect regulatory compliance. Warranty information is provided at Cisco.com on the Product Warranties page. Using a unified view of data center resources, Cisco and our industry-leading partners deliver services that accelerate your transition to a unified computing environment. Cisco Unified Computing Services helps you quickly deploy your data center resources and optimize ongoing operations to better meet your business needs. For more information about these and other Cisco Data Center Services, visithttp://www.cisco.com/go/dcservices. Cisco has significant experience in listening to customer requirements and providing solid technology innovation for the enterprise data center. Cisco delivers standards-based solutions backed by a broad partner ecosystem of industry leaders to provide end-to-end customer solutions. Unified computing elevates the traditional product classification of network, server, storage, operating systems, and applications to a vision that encompasses the whole data center. Cisco, as one of the largest technology providers in the world, has the resources, expertise, and customer focus to deliver on this vision. For more information about the Cisco UCS 6324 Fabric Interconnect, visithttp://www.cisco.com/en/US/products/ps10276/index.html or contact your local account representative. نرم افزار VMware Horizon 6.2 که نسخه جدید مجازی سازی دسکتاپ می باشد دارای قابلیت های جدیدتری نسبت به ورژن های قبلی خود دارد که از آنها می توان به ویژگی های جدید در سرور ها و کلاینت ها و پلترف اشاره نمود. به روشنی می توان گفت این نسخه از نرم افزار VMware Horizon قابلیت های کلیدی را پشتیبانی می کند. در ابتدا در مورد قابلیت های پلتفرم سرور توضیحاتی را می دهیم. نرم افزار VMware Horizon نرم افزار های Publish شده ای را در داخل Horizon 6 عرضه می کند. نرم افزار Horizon اکنون مدیریت متمرکزی برای VDI و RDSH فراهم می سازد. در هاستهای RDS 6.2 می توان بوسیله View Composer عملیات Provisioning را انجام داد و این امکان به ما اجازه می دهد تا با مدیریت یک Image و ایجاد چندین هاست RDS از آخرین امکانات موجود استفاده نماییم. دسکتاپ کاربر با RDSH نیز بواسطه پشتیبانی از نرم افزار های 3D ارتقا یافته است. یک RDSH می تواند به یک NVIDIA GRID vGPU وصل شده و بتواند نرم افزار های گرافیکی خود را اجرا کند. کلیه این قابلیت ها از طریق پروتکل PCoIP انجام می گیرد. نرم افزار کسب و کار Skype در ساختار Lync بر روی RDS پشتیبانی می شود و از این طریق راهکاری بسیار ارزان قیمت و بهینه در اختیار کاربر قرار می دهد. در مورد RDSH می توان گفت که قابلیت Load Balancing برای فرمهای RDSH دارد. مدیران شبکه اکنون می توانند سرور های خود را از لحاظ پردازنده و حافظه و خیلی پارامتر های دیگر Load Balance بکنند. با توجه به امکان استفاده از رول های Affinity و Anti-Affinity می توان یک ساختار LB فوق العاده در بین هاستهای RDS برقرار کنند. معماری Cloud که اکنون بسیاری از دیتاسنتر های دنیا را درگیر خود ساخته است و لزومه استفاده از Horizon نیز می باشد باید گفت که این نرم افزار قابلیت دسترسی به دسکتاپ کاربر از طریق HTML Access و Web Browser را دارد. در ساختارهای ابری VDI کاربر در صورت بروز خطا در یک دیتاسنتر می توانند همان لحظه دسکتاپ مجازی خود را در یک دیتاسنتر دیگر مشاهده کنند. از منظر کاربر می توان مزایای جدیدی بر این نرم افزار برشمرد. همانطور که گفته شد این نرم افزار قابلیت پشتیبانی برای ویندوز 10 و iOS9 را دارد. در خصوص دسکتاپ لینوکس نیز قابلیت های فراوانی همچون vSGA و vGPU 3D و نیز پشتیبانی از NVIDIA GRID VGPU به سیستم اضافه شده است. گروه فنی و مهندسی وی سنتر ارائه دهنده راهکارهای مجازی سازی دسکتاپ از مشتریان خود را به مشاهده و استفاده از لابراتوار آنلاین خود به آدرس زیر دعوت می کند. Have Cloud and ITaaS environments forced you to settle for Tier-1 storage that compromises on performance and scalability? Interested in processing 6x more transactions per second with 90% fewer disks? HPE 3PAR StoreServ 20000 Storage is a new class of enterprise flash arrays with greater than 3M IOPS, sub-millisecond latencies, a 6x density advantage, and scalability of over 20 PiB of usable capacity for massive consolidation. The flash-optimized architecture features the HPE 3PAR Gen5 Thin Express ASIC for hardware accelerated thin technologies, including inline deduplication to cut capacity requirements by up to 75%. Options support true convergence of block and file protocols, all-flash array performance, and the use of SSDs with spinning media for unmatched versatility. Enhanced Tier-1 storage capabilities and QoS controls ensure predictable service levels for all workload types while bi-directional data mobility enables virtually limitless elastic pools of storage. Mix and match flash and HDDs at will with a Flash-optimized architecture for over 3M IOPS @ <1ms latency and scalability of over 20 PiB usable with the HPE 3PAR StoreServ 20840 Converged Flash array. Get 276 TB usable capacity per rack unit, 6x density advantage vs legacy storage, with the new 7.68 TB SSD. Take advantage of flash for less than $100K (USD) with HPE 3PAR StoreServ 20800 Flash Starter Kit. Reduce capacity requirements by up to 75% guaranteed when migrating from legacy storage to 3PAR StoreServ Storage with the HPE Get Thinner program. Provision block storage volumes as well as file shares from a single capacity store with HPE 3PAR File Persona Software Suite. Scale capacity up to 9 PiB raw and over 20 PiB usable with up to eight controllers in a Mesh-Active cluster. Reduce performance bottlenecks with flash-optimized hardware and software for greater than 3 million IOPS at sub-millisecond latencies. Lower the cost of all-flash to $1.50 USD per GB usable without sacrificing performance. Achieve a 6X density advantage or more with over 9 PiB of usable capacity in a single expansion rack. Cut capacity requirements 75 percent without sacrificing performance. Support the most rigorous, on-demand infrastructure with a virtually limitless, elastic pool of storage. Run workloads at the right cost and SLA with one-click workload balancing. Slash management overhead with unified management of block, file, and object access and storage that is self-configuring, self-provisioning, and self-optimizing. Maintain high availability and Tier-1 resiliency with a complete set of persistent technologies. Deliver consistent QoS with HPE 3PAR Priority Optimization Software. Achieve application-integrated recovery with near-synchronous RPOs. Simplify backup and restore with HPE StoreOnce Recovery Manager Central for application-aware, storage-integrated data protection. Modernize your EMC, HDS, and IBM storage infrastructure with painless, no-cost data migration. Seamlessly move data between any model HPE 3PAR StoreServ Array. Boost flash performance by 35 percent and reduce latency by 2.5x with 16 Gbps Fibre Channel. IBM® is trademark of IBM Corporation in the United States and/or other countries. Red Hat® Enterprise Linux® Red Hat is a trademark of Red Hat, Inc. in the U.S. and other countries. Linux is a registered trademark of Linus Torvalds.